Drawing and Painting, Figure Drawing, Portraiture and Landscape, Fashion Illustration and Design are just a few of the types of lessons that are offered both privately and semi- privately at the studio of Annette Alessi Fine Art. Call the artist discuss your artistic needs. Her studio is located in Garnet Valley, PA. The instructor charges $50/ hour for private lessons and $40/ hour for Semi-Private lessons, up to 3 people. To see a step by step process click here. To see Youtube videos click here. Instructed by Annette Alessi, this class demonstrates a particular approach to building a painting. The idea reflects that of the old masters who would take their students to the museum for a “paint along” to learn from the masters. 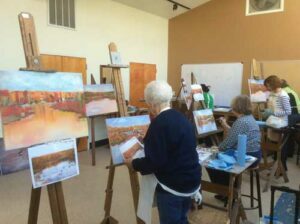 Working from photos supplied by the instructor, students follow along with the process step-by-step over a period of 5 or 6 weeks to create an oil painting. The intent of the class is not to copy but to steer students through a process, to encourage them to incorporate featured techniques into their own technique repertoire. Since the intent is about the process, the student may or may not complete a painting depending on the level of the student. $3 materials fee is included in the total cost. See materials list on the CCAA website when you go to register. 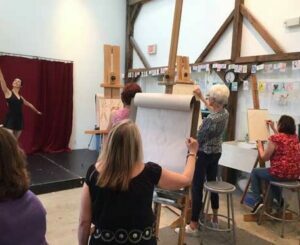 The instructor has an extensive background in the figure, having been a fashion illustrator in the early years of her art career. Read more about Annette in her bio. 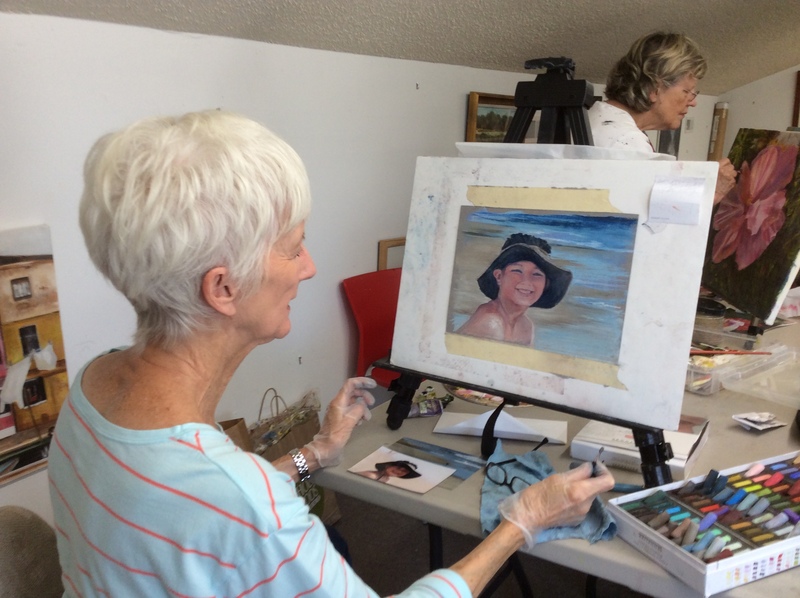 Click here to see some of Annette’s figurative works and portraiture. Model fee will be split between all the students. Total model cost is $45.00.This class is intended to run once a month. Check your email for more future dates. Student working on pastel portraiture. Use this time to do something you have always wanted to try, OR to finish a piece that needs completion. This workshop is open to art students of all levels. 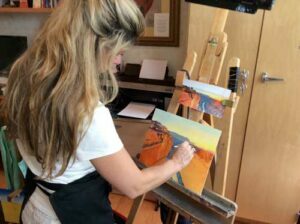 You will receive individual guidance with tips and techniques to help you enhance your painting skills or drawing skills. My specialty is the portrait and the figure and most people know me for my Brandywine Valley landscapes, so I can help you with many subject matters from the face to the landscape in whatever medium you choose. Enjoy painting outdoors at the beautiful Longwood Gardens while instructor and fine artist, Annette Alessi, gives pointers on composition, color balance, technique, and more. Students can choose from close-up or distant scenery since we will be aiming to paint in the flower garden area. 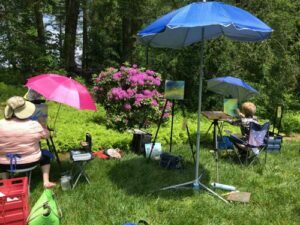 Students must bring their own painting supplies including: an outdoor easel, plein air umbrella (optional), any brushes and medium, canvas or paper of choice. Also, feel free to bring a hat, bug spray, sunscreen, a chair, and lunch if desired. Date and Time: To be determined by the student and instructor. Price: $50.00 / hour, total workshop time approx. 2-3 hours. Semi-Private Price: $40.00 / hour/person. Up to 3 people. Total workshop time approx. 2-3 hours. To pay with a Credit Card, Please call 610-742-7474.